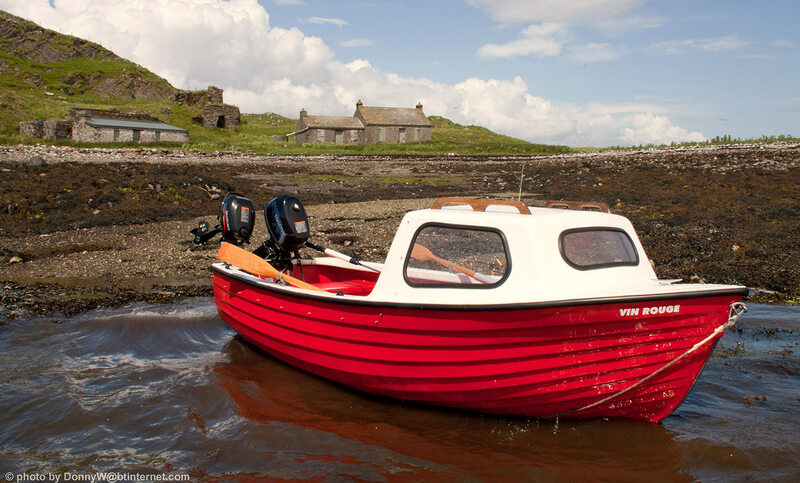 The Family Fisherman was the first design Highlander Boats Ltd built and has been on the market for thirty years. 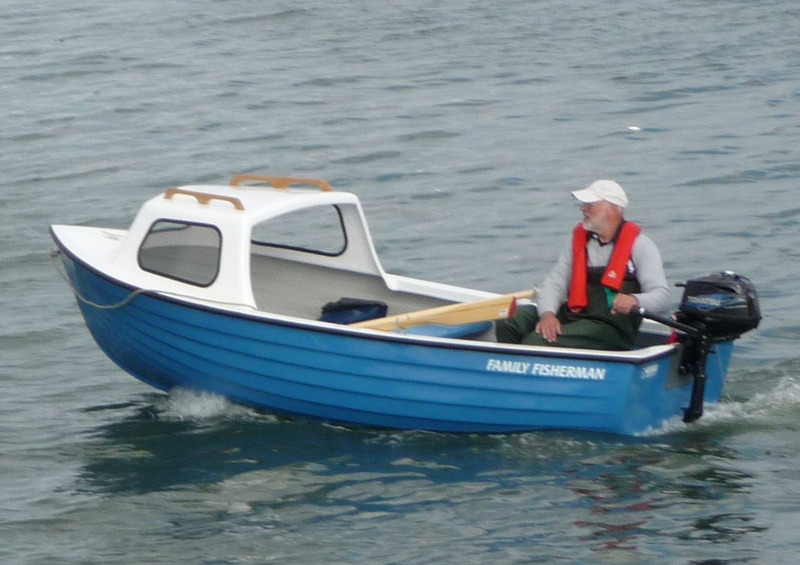 The Family Fisherman was the first design Highlander Boats Ltd built and has been on the market for thirty years. 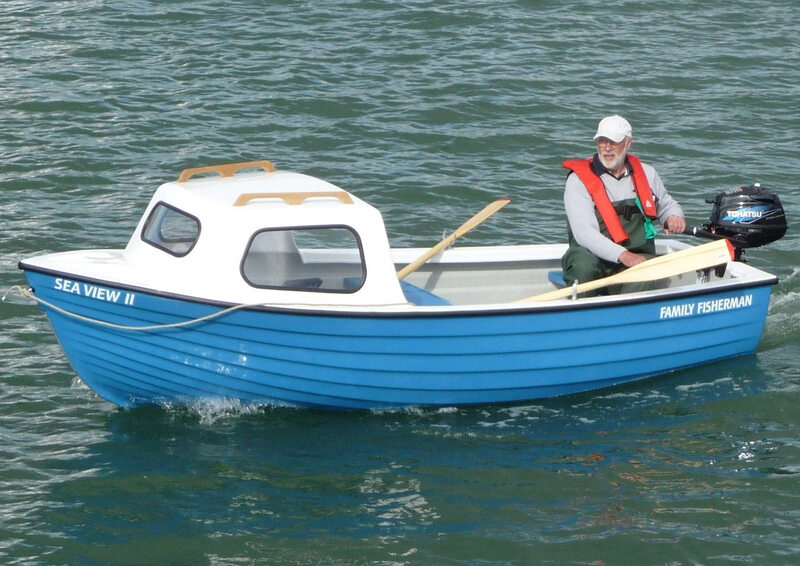 A useful little boat, it has many uses ranging from family picnics, exploring, wildlife spotting, bird watching, fishing and fun in general. 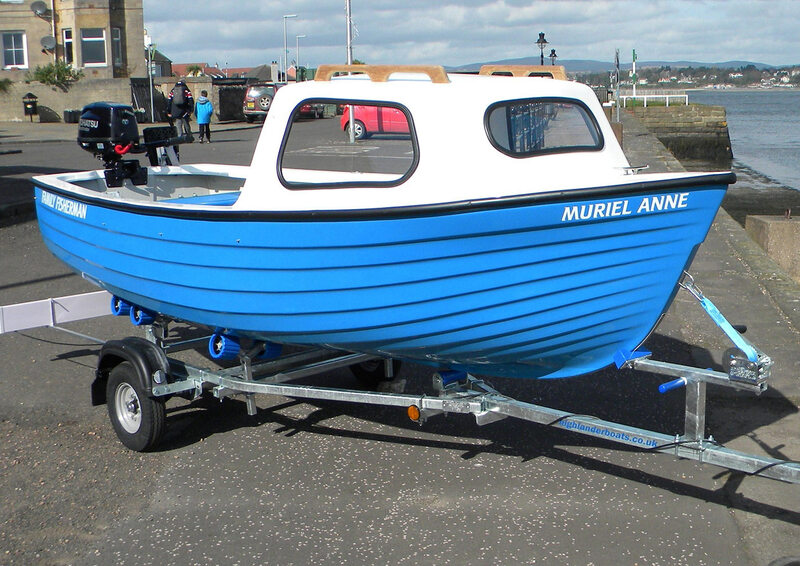 Its shallow draught allows access to shallow areas and results in easy launching and recovery by one or two people, whilst its relatively low weight makes for easy handling ashore and it tows easily behind a small car. The boat requires little maintenance other than cleaning and the occasional polish to maintain its appearance. The round bilge, simulated clinker hull has a slightly traditional appearance which appeals to many and we are still surprised by the positive reaction the boat receives at boat shows, where its simple layout and bright colour scheme attracts a lot of attention. 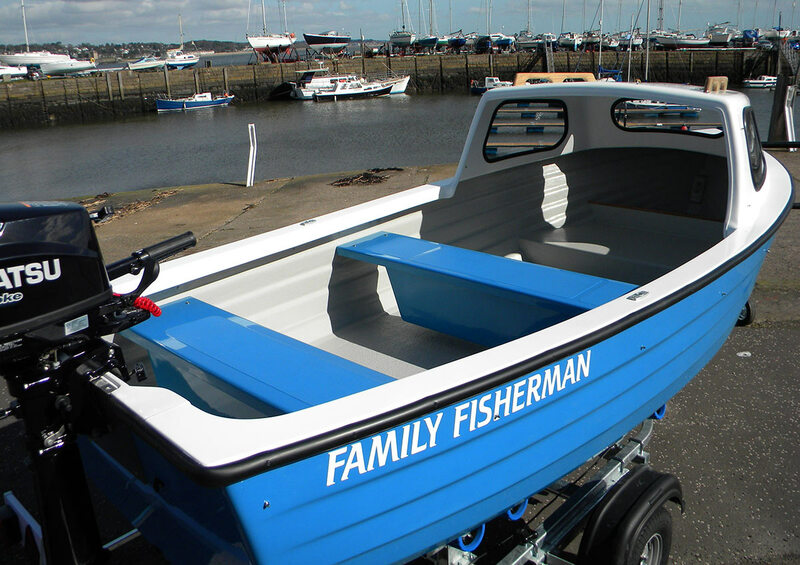 We can offer a Family Fisherman with wheel steering and remote engine controls based on the 5hp Tohatsu if required . While this does add to the cost, many people are more comfortable using a steering wheel and single lever control rather than a tiller control engine. Buoyancy is provide in the form of a large bow tank and two separate tanks bonded to the thwarts. The area under the deck can be either a buoyancy tank or flooded to act as a ballast tank if required. 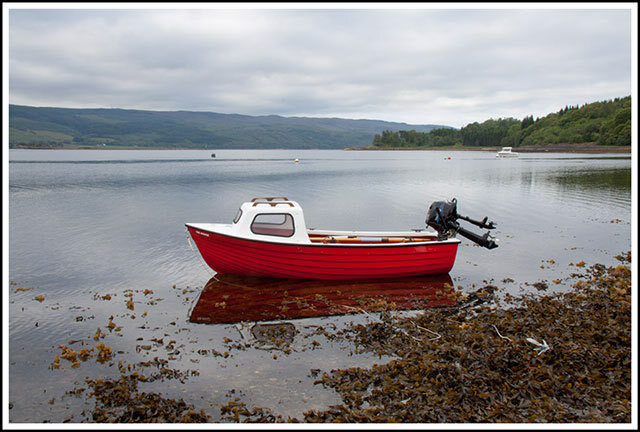 All our mouldings are hand made using quality materials we offer a three year Highlander Boats Warranty on our boats, this is unusual on small boats and reflects the confidence we have in our products, the usual exceptions apply! The boat is easily powered by small outboard engines. 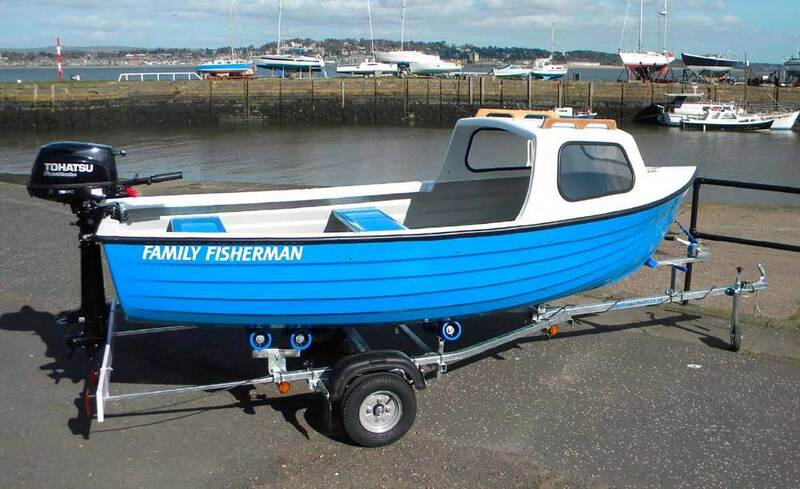 Depending on our customers requirements the Family Fisherman can be supplied with Electric Motors for use in freshwater lakes or creeks or petrol outboards for sea lochs and coastal use. The most commonly used engines are the 3.5hp and 4hp Tohatsu and Mariner Outboards. These will give speeds up to 5 or 6 knots depending on payload and conditions, this top speed is governed by the hull shape, so there is little point fitting more than say a 5hp Tohatsu which allows an engine with a remote tank to be used. From a practical point of view, a lightweight Tohatsu, Suzuki or Yamaha outboard is easily handled on shore and takes up less space in a car boot or camper van. Our boat packages are based on Tohatsu Outboards, however we will supply other brands if required. Trailers are normally Indespension or Extreme Marine, both produce quality products. The boat is available as a basic boat or as a package with engine and or trailer.